View More In Wreaths - Page 2. The circular shape of a wreath represents eternity, as there is no beginning and no end. It symbolizes growth and everlasting life. Bring a circle of life to your front door and enhance you holiday decor. 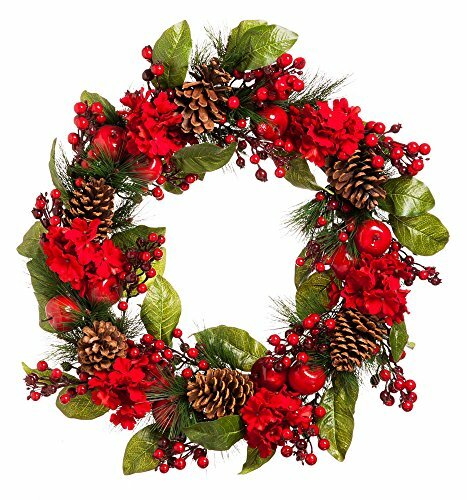 Crafted from acrylic materials to emulate live growth, this 24-inch wreath is suitable for indoor or outdoor use. To hang, a hook or wreath holder is required and is sold separately. This base of the wreath measures approximately 24 x 5 x 24 inches. If you have any questions about this product by New Creative, contact us by completing and submitting the form below. If you are looking for a specif part number, please include it with your message. Vickerman Modesto Mix Pine Artificial Wreath with 400 Clear Lights, 72"